The official opposition party in South Africa, the Democratic Alliance (with 22 per cent voter support) is testing foreign relations waters and upsetting the governing African National Congress (with 62 per cent voter support). The US recently experienced diplomatic histrionics over then President-elect Donald Trump accepting a direct telephone call from Taiwanese President Tsai Ing-wen congratulating him on his triumph in the elections. Trump is the first US leader to have direct contact with a Taiwanese leader since 1971. By way of United Nations General Assembly Resolution 2758 (October 1971), the Republic of China (Taiwan) was replaced by the Peoples Republic of China in the UN and other multilateral organizations. The US has maintained a One China Policy with a rider on protecting Taiwan from any Chinese military aggression. Since then, the US has moved closer to China economically, accepting Chinese membership in the World Trade Organization and placing key US Treasury Bonds with Chinese Government backed financial institutions. Trump has also indicated a shift in US policy over Israeli illegal settlements by appointing pro-settlements advisers in key positions including ambassador to Israel, his pro-Israel son-in-law as Middle East Envoy, and promising to move the US embassy to disputed Jerusalem. Israel has been emboldened by this, announcing new settlements two days after Trump’s inauguration as president. Across the Atlantic, South Africa experienced its own Taiwanese melee when the Mayor of Capital City of Tshwane (Pretoria) Solomon Msimang (a member of the opposition Democratic Alliance party) accepted an invitation to Taipei from its Mayor Ko Wen-je. An invitation of this nature is highly political and not seen as low level in diplomatic craft. This Taiwan visit was immediately followed by a high level visit by Democratic Alliance (DA) chief Mmusi Maimane and several senior parliament officials from his party to Israel. The visit came on the heels of an United Nations Security Council resolution insisting that Tel Aviv is breaking international law in its construction of settlements in the West Bank. Both Trump and Maimane including Mayor Msimang are political novices. Maimane and Msimang each have no more than six years political experience and joined the DA in South Africa which positions itself as the anti-thesis of the governing African National Congress (ANC). Taiwanese officials may have used the apparent naiveté to reach the two. With limited diplomatic lexicon and insouciant statecraft a lot can unravel in a negative way if the instigator has ulterior designs. There is important political symbolism in that Maimane chose to visit Netanyahu after international condemnation as such visits are often seen as lending solidarity to the condemned. The DA has a strong wealthy Jewish base in South Africa which could play well for Maimane as he consolidates his power within. The official diplomatic policies of the US and South Africa in regards to Taiwan are similar; both countries have trade liaison offices in Taipei, and vice versa in Washington and Tshwane, respectively. The DA argues that other government officials from the ANC have visited Taiwan in recent times including cabinet members – but this argument misses the crucial nuance that these visits where not by invitation of Taiwanese state or political actors. South African-Taiwanese relations are conducted at the departmental heads level and not political heads like mayors or cabinet ministers. No governing ANC officials are known to have met political actors in Taiwan, although the ANC encourages cordial business, trade and civil society engagements between Taiwanese and South Africans. On Israel, South Africa encourages its citizens not to have any cultural, economic contact or visits to Israel unless these are about peace-building. South Africa also demands that products produced by Israel from occupied territories must be clearly labeled so its citizens could exercise a conscious choice in importing these products. European Union diplomats have been urging their governments to discourage their citizens from doing business in or investing in illegal Israeli settlements. In defending itself, the DA cites former Presidents Nelson Mandela’s and Thabo Mbeki’s past visits to Israel, but here again the critical nuance is not observed that the Palestinian Authority had arranged the trips and they were on behalf of the oppressed people. None of the trips occurred on the eve of a damning UNSC resolution over crass illegal actions by Israel. Maimane said his trip was both spiritual and official as he met Prime Minister Benjamin Netanyahu with all the trappings of a foreign dignitary visit. Official photographs released show the South African flag together with the Israeli flag side by side as the pair shook hands. To persons unawares, it looks as though the South African state is throwing its weight behind Israel weeks after the UNSC damning resolution. “In its international relations, South Africa has become an active participant within the ambit of the OAU and the Non-Aligned Movement, as well as within the UN system. A permanent continuation of diplomatic recognition of the Republic of China on Taiwan is inconsistent with South Africa’s role in international affairs”. On Palestine, Mandela made it clear that he supported the return of all refugees and that the map lines must be returned to the situation prior to the 1967 borders. Mandela said: “South African freedom will not be complete unless the people of Palestine are freed”. Interestingly, the DA is fashioning and labeling itself as a party which best carries Mandela’s values better than Mandela’s own party the governing ANC. From former president Thabo Mbeki to incumbent President Jacob Zuma, South African national interest and diplomatic relations are in tandem with an African Agenda and this is what also interests China. At risk is a 1.3 billion-population China viewing South Africa as risky to its global diplomacy and moving its mass to Nigeria instead over such sensitive issues as Taiwan. South Africa is being awakened to what a DA led national government foreign policy could be -international recognition of Taiwan being withdrawn in favor of China. And regarding Israel, there are over 20 UNSC resolutions calling on Israel to end its illegal armed occupation and suppression in the occupied territories. It is yet to be clear whether the International Criminal Court will pursue charges against Israel after the new settlements build program. Some commentators have claimed that the DA’s actions amount to treason, but this is a rather far-fetched and harsh proposition. At worst, they showed wetness behind the ears and lack of proper risk analysis especially during these very sensitive times where China is on alert on South China Sea activity and Taiwan in particular. At best the DA’s eagerness to appear totally in disagreement with the ANC is becoming a liability to South Africa’s national interest. South Africa will have far more to lose than any investment it can attract from Taiwan should China panic and start moving towards Nigeria or Kenya instead. Nigeria immediately moved to expel the Taiwan trade office from Nigeria following the DA visit to Taiwan; this move is seen as Nigeria’s response to position itself as a safer choice for China. 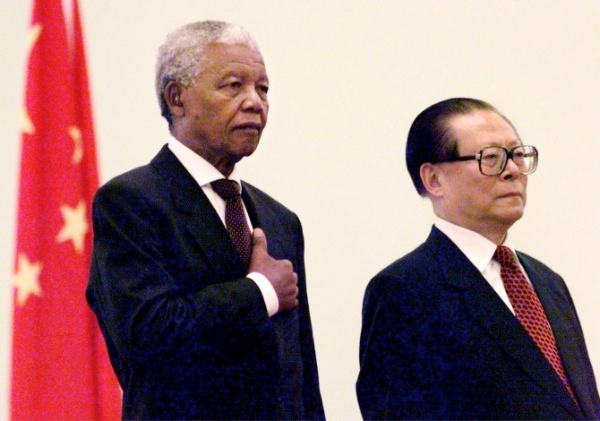 One shouldn’t ignore, too, that Taiwan and Israel cooperated with South Africa’s Apartheid regime and maintained strong diplomatic and trade relations and created a tri-partite military and security bloc developing weapons and South Africa’s nuclear weapons and cooperating in suppressing the ANC, amongst others. The DA parent party, the DP was an accomplice in that it sat in the Apartheid parliament as opposition to then ruling National Party giving the apartheid regime credence of being a “multi-party” political system. Today, the DA has many black leaders in its attempts to fashion itself as a non-racial party.